This necklace set is a step into the wild side for me. It was created while attending a weekend class by Connie Fox..... 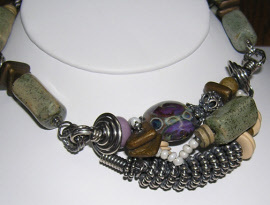 The necklace is a combination of individually hand made lampwork glass beads in shades of purple and green, ceramic beads, sterling silver findings and heavy gauge sterling silver wire. Necklace adjusts from 18¾ - 20 inches in length and weighs 4.0 oz. 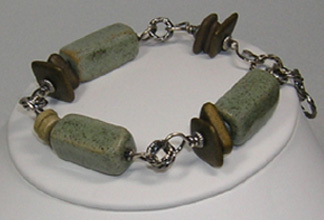 All wire is hand coiled and shaped and dipped in liver of sulfur for an antiqued appearance. Earrings measure 1¾ inches in length. Bracelet adjusts from 7½ - 8¾ inches in length and fits a wrist measurement of 6¼ - 7¼ inches best. 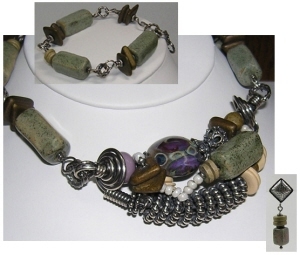 Earrings and bracelet are made using ceramic beads, sterling silver findings and wire.